During pre-commissioning of an electrical installation one may sometimes face a situation where the insulation test shows very low insulation resistance values but do not indicate any fault as such in the cable. Main reason of such faults in cables with plastic insulated outer sheath is the damage of this sheath while transportation or laying. This permits the penetration of water into the cable and as a consequence it enhances the growth of moisture and other corrosion based damages in power cables. Moisture is one of the primary reasons of such cable faults. A sheath damage in communication cables will result in reduction of the transmission quality which is in today’s high performance data transmission requirements almost equal to a loss of the line. A sheath damage in a power distribution network, if not associated with a direct damage of the cable insulation, will seldom lead to a fast break down and failure of the cable installation. From the moment of damage until the appearance of the real breakdown, many months or even years can pass. Cables if not protected from the ingress of water from points of sheath damage can lead to additional danger of cable joint failure due to water spreading though the conductors into the joints. Testing of integrity of the outer sheath before energising a cable is very important because it provides the possibility of an early elimination of beginning of cable faults. 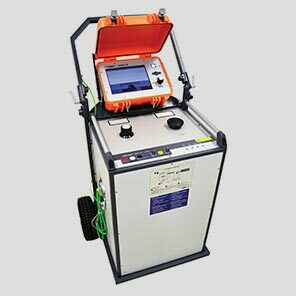 We provide services for Cable Sheath Testing and Sheath Fault Location & Pinpointing through various highly specialized set of equipmentand experienced personnel in this field. We locate sheath faults by four different methods i.e. DC Impulse-Method, Surge Impulse Method, Audio Frequency method with direct or capacitive coupling and Audio Frequency Method with 4,8 Hz and A-Frame. The regular and early testing, detection and location of sheath faults will drastically reduce the amount of faults, especially in medium voltage cables with extruded outer insulation.